Objective: Evaluation of needs and satisfaction of families of patients admitted to intensive care unit (ICU) is an important concern. The aim of this study was to determine relatives’ perception and satisfaction about ICU in our hospital. Material and Methods: For evaluation, a questionnaire study was conducted in medical ICU. During study period, families of ICU patients were included into the study and a face-to-face survey was administered by the ICU physician to those who wish to participate. Results: A total of 50 family members were included into the study. Of them all reported to know the exact diagnosis for ICU admission however only 32% of them had the correct diagnosis, whereas others stated previous comorbidities as the main admission reason. Even though all the patients admitted to the ICU were critically ill, 23% of relatives classified their patient’s status as mild or moderate. Seventy two percent of study participants stated that the information given about their patients was adequate, and 70% of them reported that the content of the procedures described sufficiently. The overall satisfaction was good or very good in 88% of participants. It was observed that longer stay in the ICU was associated with better satisfaction (p<0.05). 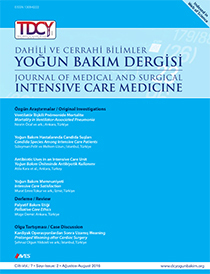 Conclusion: Detailed information about patient’s status, including admission diagnosis, and all interventions should be given to ICU patients’ relatives continuously from the first day of ICU admission.